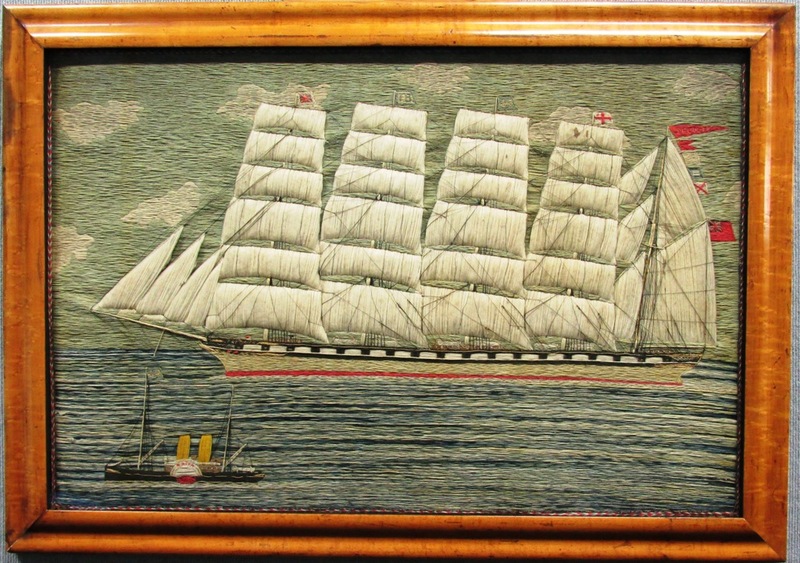 Medieval, Regency, Victorian Age sailors were experts with in all forms of needlework. Historians, amateur and professional alike, seem to recognize that as fact. By the 1700’s sailors were probably knitting, but there isn’t much in the way of evidence to support it. They had to be. But I can’t find any historical evidence to support it. 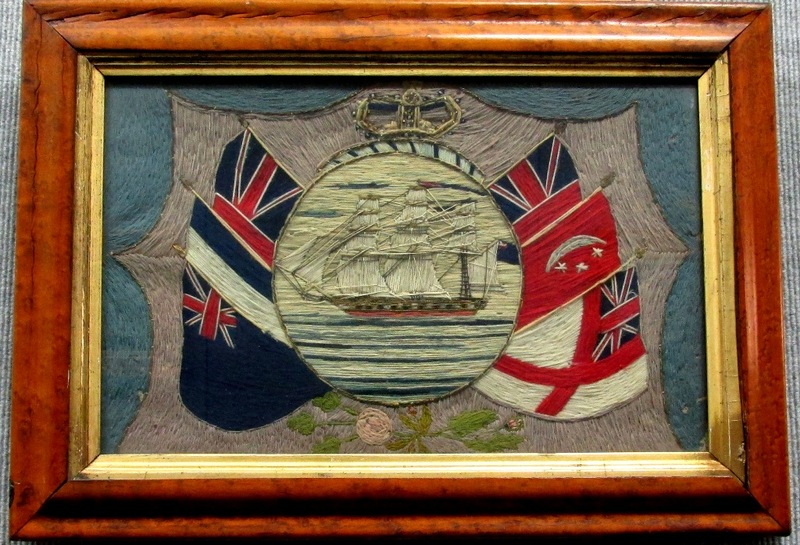 When it comes to sailors and their needlework, historians seem to only be interested in the tradition of sailors’ embroidery. And I can see why. British maritime woolworks, aka “woolies” are amazing. That may look like a painting but its not. Its embroidery (probably on a piece of old sail). I’m in the midst of re-reading all my Hornblower novels by C. S. Forester. Good ol’ Hornblower with all his mental agonies, crippling self-consciousness, and startled amazement that people seem to like him is slowly making his way from lowly Midshipman to lofty Admiral. Somewhere in all that (I think its in Lieutenant Hornblower) there is the briefest mention of the men enjoying a free half-day and plopping down on the ship deck with their embroidery. That of course sent me on a pleasant little trip through maritime history. 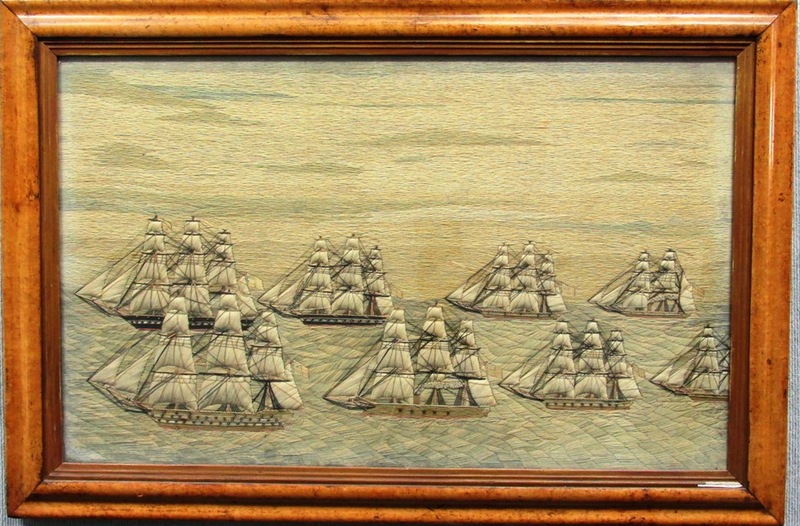 Oh yes, those English sailors were master embroiders. The practice of scrimshaw, carvings made on bone, gets more attention and is more widely recognized as a maritime folk art. But those guys were stitching too. From the early 1800’s until the turn of the next century many English sailors spent their precious free time with needle and thread. While it is regarded as unusual for men to have had this particular hobby for making woolwork or string pictures, it is actually not so strange; until the 1880’s, seamen had no standard uniform and had to provide and maintain their own. Another task they faced was repair of the sails- coupled with the need to mend their own clothing, the sailors had to have at least a rudimentary knowledge of sewing. Artistically these are classified as folk art and described by antique/auction house types as “charmingly naive”. Nearly all surviving examples are of naval ships. They were made to commemorate the man’s service and probably given as a gift to a loved one. The men who made these were probably forced aboard ships by press gangs. Nearly all sailors were pressed into service. They were worked harder then we can really imagine and in horrific conditions. Once aboard the ship they were not allowed off. Ever. They existed on limited rations of fresh water, boiled dried peas, boiled salt pork and beef, and a single tot of rum per day. They were prisoners, expected to follow every order on pain of flogging and or hanging. Life in the Royal British Navy, and probably any European navy, was brutal. I guess that’s why I get a little pissed off when comfortable, well-educated types call these masterpieces of needlework “naive”. I very much doubt there was any naivete left in those men. Some pieces were made on land by men who survived their service and those are in better condition and made from better materials. The pieces made while at sea are on old scraps of sail cloth or cotton duck and worked in whatever thread was available. The designs were hand drawn on the cloth and then stitched over. The techniques these sailors used included… all. Lol. Why should they have felt the need to be purists? You’ll find cross-stitch with lots of long stitch (which saved thread), chain stitch, darning technique, you name it. Virtually of these pieces all went unsigned so the artists’ identities are lost to time. The images I use in this post are clickable links. You can follow those back to the source and find close-up detail pictures along with more information if its something you’re interested in. Today people pay ten’s of thousands of dollars for these pieces and most seem to be in private collections. That’s kind of a shame. I’d love to see them in museums. The art of warriors holds a special place in my heart and I wish it received more attention. Maybe this little post will help with that. 9 Comments on "A Sea of Stitches – Sailors who took their stitching with them"
I have viewed an exhibit at the Peabody/Essex Museum in Salem, Massachusetts that has numerous articles stitched by Sailors, sadly I cannot seem to locate it online. Wow! I’m glad to hear of it. When I finish up today’s classes I’ll go looking for it. Thanks for the heads up. Very beautifulwork. Makes you wonder if people consider our knitting “naive” because they expect stranded colorworked cables or something! Thank you for the lesson. I’ve read and loved Hornblower but never wondered about the needlework. You are very welcome! Perhaps I’m just easy to distract than others, lol. And to be honest much of the naval lingo in those books goes right over my head. But the stitchery… that I can get into.